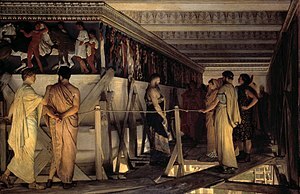 Phidias (circa 480 BC—430 BC), was a Greek sculptor, painter and architect. His Statue of Zeus at Olympia was one of the Seven Wonders of the Ancient World. He also designed the statues of the goddess Athena on the Acropolis. These were the Athena Parthenos inside the Parthenon and the Athena Promachos, a bronze statue of Athena near the entrance to the Acropolis. 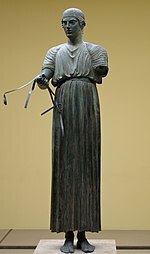 Phidias was twice indicted for stealing some of the costly materials used in the construction of his two great statues: at Athens, he was accused of taking some of the ivory from the Athena Parthenos; at Olympia, of stealing some of the gold of Zeus' cloak. A false witness against Phidias testified. Phidias died in prison. ↑ Romer, John. The Seven Wonders of the World. The Statue of Zeus. p. 17. This page was last changed on 12 March 2013, at 20:15.